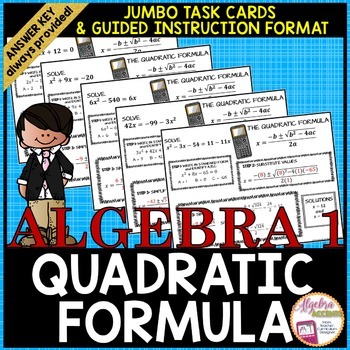 Step 1: Write the quadratic equation in standard form and identify A,B,C. Step 2: Substitute the A,B,C values. Step 3: Simplify and Split into 2 equations. 2 formats are included to meet varying teaching styles and student needs. 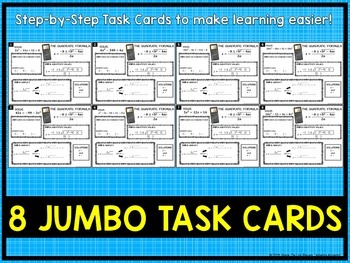 Use the Jumbo Task Cards for independent practice and/or use the Whole-Class Instruction Format for guided practice on the Smart Board/ActivBoard. 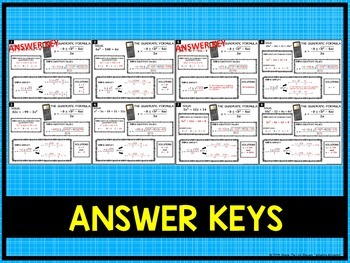 Need more resources on QUADRATICS? CLICK HERE! SIGN UP for my newsletter and receive a surprise freebie! And don't forget to check out my BUNDLES for huge savings. © Copyright 2017 Marie De Los Reyes, "Algebra Accents." All rights reserved by author. This product is to be used by the original purchaser only. Non-transferrable. Copying for more than one teacher or classroom, or for an entire department, school, or school system is prohibited. 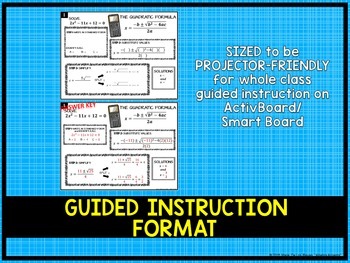 Intended for single classroom and personal use only. This product may not be distributed or displayed digitally for public view, uploaded to school or district websites, distributed via email, or submitted to any file sharing sites unless password protected for student use only. Failure to comply is a copyright infringement and a violation of the Digital Millennium Copyright Act (DMCA).